Established in 2002 On Ensemble is one of the most respected ensembles in the taiko world. Led by childhood friends Shoji Kameda and Masato (Maz) Baba, On Ensemble is recognized for infusing the powerful rhythms of taiko with a wide range of musical influences from jazz and rock to central asian overtone singing. Their fearless musical exploration has expanded the artistic range of the taiko and has taken these ancient instruments into new realms. The group’s unique sound has been praised as “completely original and brilliantly conceived.” Modern Drummer magazine calls On Ensemble “an exciting taiko ensemble looking at new ways to apply traditional Japanese drums.” On Ensemble was the first American taiko group to be invited to perform at the National Theater of Japan for the prestigious Nihon no Taiko concert series. Shoji and Maz were taught taiko at an early age (8 and 6) by Maz’ parents, pioneering taiko players Jeanne Mercer and Russel Baba. The duo has been playing and making music together for over 30 years and are recognized as two of the brightest stars in the taiko world. Together with the other members of On Ensemble they combine their study and deep appreciation of Japanese traditional music with equally formative experiences as DJs, jazz musicians, electronic music producers, and rock bassists to produce, record and perform some of the most compelling and creative taiko music. The group has released three critically acclaimed albums, Dust and Sand, Ume in the Middle and Bizarre Heroes and their music was featured in the award winning short film Yamasong. From outdoor festivals and large concert halls to intimate art spaces, On Ensemble shares its unique music with audiences both young and old. The group tours regularly to large metropolitan areas and small rural communities and has a 15 year history of touring and performing. Past performances include the Cerritos Center for the Performing Arts (Cerritos, CA), the Maui Arts and Cultural Center and University of Hawai’i Hilo (HI), California Worldfest (Grass Valley, CA), Chico World Music Festival (Chico, CA), Athenaeum Theater and the Old Town School of Music (Chicago), Grand Performances and the Aratani Theater in downtown Los Angeles, Shibuya O-nest (Tokyo), National Theater of Japan (Tokyo), Freight and Salvage (Berkeley, CA), Edmonds Center for the Arts (WA), Juan De Fuca Festival (WA) the Oregon Bach Festival (Eugene, OR), an Ohio Arts Council IMPACT tour with performances in Medina, Archbold, Cincinnati and Urbana (OH), a tour of Montana and Idaho with stops in Mountain Home, Salmon, Sandpoint, Dillon, Missoula, Helena and Whitefish. In 2005 On Ensemble released its first studio album Dust and Sand to critical acclaim. The independently produced album spent several months on the New Age Reporter charts reaching as high as number three in October of 2005 and received national airplay. In 2007 the ensemble released their first live CD and a DVD of their performance at the Cerritos Center. In 2009 On Ensemble released its second critically acclaimed studio album Ume In the Middle. In 2010 the group collaborated with director Sam Koji Hale to create a short film based on the On Ensemble track “Yamasong” from the album Ume in the Middle. The film was produced by Heather Henson and was screened at over 30 film festivals winning Best Fantasy Short and Best Animated Film at the Dragon*Con Independent Film Festival. In 2013 the group released their third studio album titled Bizarre Heroes and was invited to perform at the prestigious Nihon no Taiko concert at the National Theater of Japan. In 2017 the group released a collaborative live album Rotations with Chicago based Ho Etsu Taiko. For all of their avant-garde musical explorations, On Ensemble is supported by one of Japan’s most important traditional-culture bearers, Miyamoto Unosuke Shoten, instrument maker to the emperor of Japan. This support empowers On Ensemble to utilize authentic finely crafted Japanese instruments in its fearless exploration of taiko. Each year, On Ensemble visits dozens of schools to provide educational outreach activities. Providing context for the group’s music and insight into Japanese drumming in particular, On Ensemble’s lecture-demonstrations are tailored to a variety of settings, from elementary school gymnasiums to university lecture halls. On Ensemble school presentations are exciting, interactive demonstrations of the powerful Japanese drums known as taiko. The 50-minute presentations intersperse cultural and musical background information with dynamic, live music. The performance utilizes Japanese percussion, string, and wind instruments. Students learn about “traditional” and “contemporary” influences and how the drums made their way from ancient origins to their current use in ensemble taiko. Students participate in the oral tradition of taiko, learning rhythms by vocalizing. At the end of the performance, selected audience members join On Ensemble on stage for a hands-on attempt at playing the big drums. On Ensemble’s members are widely-respected teachers and the group maintains a busy schedule of taiko workshops and hands-on courses. On Ensemble workshops provide in-depth instruction in a variety of topics covering taiko technique, composition, and music theory. The group organizes an annual workshop tour, teaching taiko in cities across the country. On Ensemble’s taiko courses provide structured, hands-on instruction to taiko players in the Los Angeles area. Previous offerings include, “Improvisation 101”, “Ridiculous Rhythms”, and “Multi Drum Technique”. Most courses are designed as a supplement to taiko players’ studies in other groups, focusing on a specific skill set and the fundamentals and practice concepts necessary for improvement. Shoji is a Grammy nominated musician, composer and producer and founding member of On Ensemble. He started playing taiko at the age of 8 and has played continuously since. He was selected through a highly competitive process as an Asian Pacific Performance Exchange fellow, collaborating with master artists from the Philippines, India, Indonesia, Malaysia, Thailand and the USA. As the group’s primary creative force he has produced On Ensemble’s critically acclaimed CDs Dust and Sand, Ume in the Middle and Bizarre Heroes. He also composed an original score for Abduction: The Megumi Yokota Story, Audience Award winner for Best Documentary at the Slamdance Film Festival. He was featured in the music of the hit NBC TV show “Heroes” performed with Stevie Wonder at the 2008 Democratic National Convention and received a Grammy nomination with jazz fusion band Hiroshima for his work on their album Legacy. His track “Yamasong” was the inspiration for Sam Koji Hale’s short film of the same name which won Best Animated Film and Best Fantasy Short at the Dragon Con Film Festival. After the success of the short film Shoji composed an original soundtrack for the full length sequal “Yamasong: March of the Hallows”. He has collaborated with musicians from around the world including projects and tours to Malaysia, Java, Bali, Mongolia and French Guiana. He continues to be involved in a number of projects as a composer, musician and producer including a trip-hop duo with Grammy Award winning composer Christopher Tin called Stereo Alchemy. His compositions for taiko are performed by groups around the world and he is highly sought after as a taiko instructor and composer. Shoji has partnered with other leading taiko artistis and instrument maker Miyamoto Unosuke Shoten to create kaDON.com an online venture dedicated to making high quality instruction, repertoire and instruments accessible to the entire taiko world. Masato is considered one of America's most outstanding taiko talents. He began taiko training at the age of 6 when his parents, Russel Baba and Jeanne Mercer, founded Shasta Taiko. As a member of Shasta Taiko, he gained the valuable experience performing, teaching, and touring throughout his formative years. Masato polished and refined his taiko skills for over 7 years touring world-wide with renowned American Taiko Master Kenny Endo. He also served as the Youth Director of Endo's Taiko Center of the Pacific based in Honolulu. Baba then studied taiko in Japan with Nihon Taiko Dojo and fue (Japanese bamboo flute) with Kyosuke Suzuki of the Wakayama School. He has toured the United States, Japan, Macau, and Germany and has recorded with many of North America’s leading taiko artists. He was featured in the David Mamet film “Redbelt”, performed at the Academy Awards and performed with Alicia Keys on the TV show “X-Factor”. 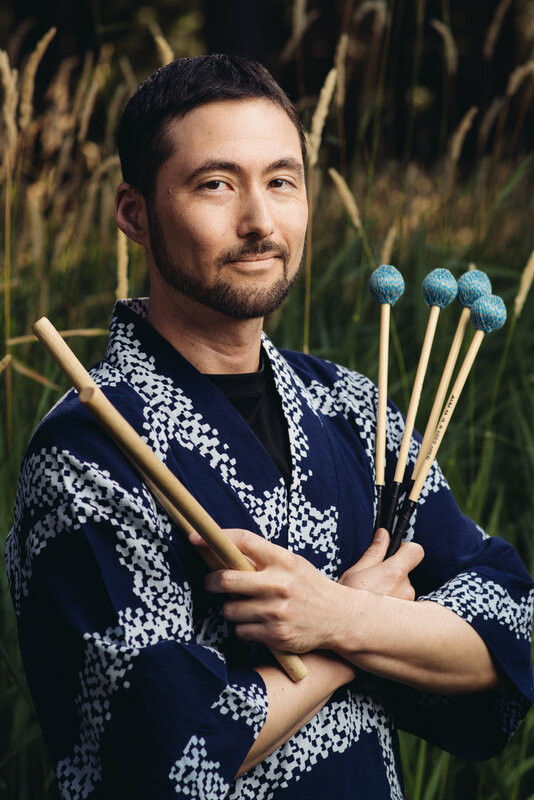 In addition to being a founding member of On Ensemble, Maz lends his talents as Musical Director to TAIKOPROJECT and serves as lead instructor and workshop leader to several Los Angeles-based taiko groups. Eien Hunter-Ishikawa is a Portland, Oregon based musician, composer, and educator specializing in taiko, shinobue, and percussion. Recognized for his musicianship and versatility, he integrates his training in jazz, Western percussion, and traditional Japanese music for a sound that evades classification. Eien was born in Saitama, Japan and was first taught by Saburo Mochizuki, a preeminent Japanese classical percussionist and a founding member of the renowned taiko ensemble Sukeroku Daiko. He toured and recorded extensively as a member of the Robert Hohner Percussion Ensemble at Central Michigan University, followed by earning his Master of Music in Percussion Performance at the University of Hawaii at Manoa. 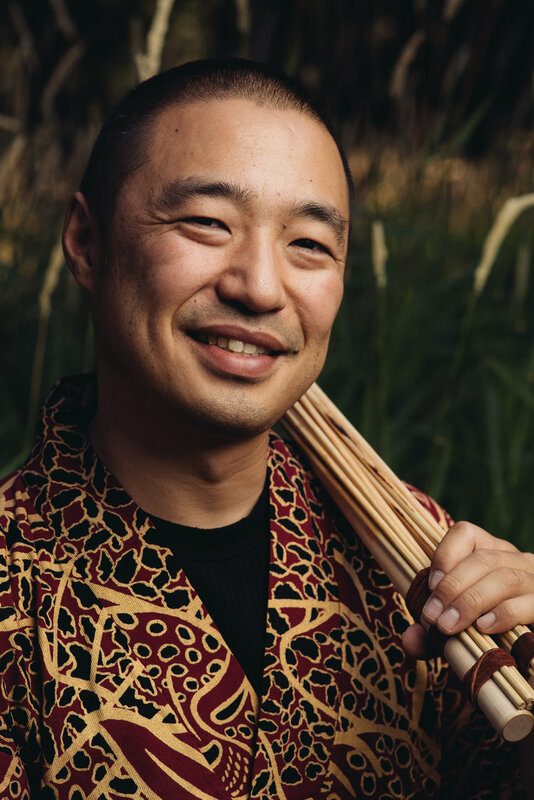 During his seven years in Hawaii, Eien performed as a member of the Kenny Endo Taiko Ensemble and taught classes at the Taiko Center of the Pacific. Currently, Eien is working to make Edo Bayashi (traditional festival music of Tokyo) more accessible outside of Japan through a partnership with his longtime teacher Kyosuke Suzuki of Wakayama Shachu. Eien is an in-demand instructor and has made his wide-ranging educational content available to everyone through the articles, instructional videos, and online lessons offered on his website. Abe Lagrimas, Jr. is a musician, composer, educator, and author who plays the drums, vibraphone, ukulele, and received his degree in Music Education at Berklee College of Music in Boston, MA. In 2012, he competed in the highly prestigious Thelonious Monk International Jazz Drums Competition and has worked with many different artists such as Eric Marienthal, Eric Reed, Kamasi Washington, Dontae Winslow, Barbara Morrison, Michelle Coltrane, Jake Shimabukuro, Kenny Endo, and continues to be an in-demand session musician in Los Angeles. As a solo ukulele artist, Abe received a Nā Hōkū Hanohano Award (Hawaii Music Award) and released multiple albums in the United States, Japan, and S. Korea. Abe has been featured at ukulele festivals in Los Angeles, San Francisco, Palm Springs, Reno, Chicago, New York, and Hawaii. His international performances include Hong Kong, Japan, Thailand, Philippines, Australia, Canada, Czech Republic, Great Britain, and toured extensively throughout China performing in twelve different cities. Abe is also the author of the first ever ukulele instructional book and curriculum titled “Ukulele Ensemble, Beginning Ukulele - Level 1” published by Consonus Music Institute. His latest book "Jazz Ukulele: Comping, Soloing, Chord Melodies" (Berklee Press & Hal Leonard) is available on Amazon. He is currently endorsed by Ko'olau Ukulele, Kaminari Cables, Fusion Bags, and Elite Acoustics.